A “High Def” life or an “Abundant Life”? Four years ago, I wrote the following for an OpEd in The Orlando Sentinel (December 19, 2007) – except for a couple of time-bound references, it still seems true today. See what you think. So while my wife and I were driving around one recent Sunday afternoon, we heard an advertisement on the radio touting the benefits of HD – high definition – radio. The, a minute later, an ad recommended HD lasik surgery (too bad for the suckers who got “regular” lasik surgery last year! ), and another pitched a soon-to-be-released DVD in HD. Shows how behind the times I am – here I thought “HD” applied only to the new generation in television technology. Apparently not! We see more and more HD products – in fact, one major electronics company now has a web site exclusively for “Living in HD” to show consumers how to maximize their HD products. The possibilities are endless! HD college classes by Internet (same credits; fewer, more hi-def, hours); HD diets (we could all use more definition, right? ); HD coffee (I know I would drink it tomorrow morning!) – wait a minute, we already have that – it’s called “bold roast with a triple shot of espresso.” But maybe we should just rename it “HD coffee.” Then of course, someone will introduce HD physical and psychological-enhancement drugs. Steroids drugs . . . on steroids! Perhaps this HD overdose reflects the law of diminishing returns: what stimulated us last month bores us this month. We need more. The picture can always have more pixels and be more realistic (one TV station now advertises not just HD but “stunning HD”). Our speakers can always produce better sound, approaching perfection. The theme-park ride can be a bit faster, higher, scarier, producing a cooler adrenaline rush. Of course to some degree, our entire economy depends on planned obsolescence and the introduction of new and better products for consumption. “High definition” is merely the newest way to identify the next phase of bigger and better widgets. Webster’s defines “definition” several ways. The commercial use (definition no. 4) says definition is “the action or power of describing, explaining or making clear” with sub-definitions specifying “clarity of musical sound in reproduction.” So high definition must mean making that which is clear even more clear; bringing further clarity to the clarity we already have. I’m starting to get dizzy! Instead of always pursuing the faster processor, the more crystal-clear picture, the snappier cell phone, maybe at this time of year especially, we should focus on things that can truly satisfy and don’t need annual upgrades. Toward the end of Proverbs, in the “Sayings of Agur” we read, “Two things I ask of you, O Lord; do not refuse me before I die; keep falsehood and lies far from me; give me neither poverty nor riches, but give me only my daily bread.” Falsehood can have many modifications, but Truth can’t be made more true. And contentment is marked by the absence of a need to seek for more. Maybe, as Americans seek for a “high definition life,” we should be careful lest we die a death of a thousand definitions. Mike Beates lives in the non-HD part of Winter Park and owns nothing “HD” yet. As I look back on this four years later, I would add that all this “HD stuff” (a technical term) – indeed to some degree all of technology – is an attempt to reverse the effects of living in a Fallen world. People expend great energy to find satisfaction and contentment in “things” when our satisfaction come ultimately in relationship – with our Creator, Redeemer, and with each other. “HD Living” is only so much cheap “noise” to distract us from the truly human. Ken Myers told us recently about a study at University of Maryland where students were asked to “disconnect” from all technology from 24 hours. No phones, iPods, internet, film, music, etc. The overwhelming reaction was complete boredom and, in many, an inability to make it through the brief “techno-fast.” Among other things, the study concluded that the more “connected” young people are through their technology, the more disconnected they are from human relationships and from reality. I am not a Luddite. I like music (live or reproduced). And I love communication in all its varied modes. But face-to-face relationship is profoundly human. We exchange that for technology at great risk to our souls. And yes, I see the irony of saying all this . . . on my blog! The holiday traditions have begun — good coffee and momma’s homemade sweet rolls in the quiet of Thanksgiving morning. Then as kids wake up, the sounds of the Macy’s Parade filter through the house. In a few hours, in addition to the smell of turkey, our oldest, Jessica, will add to the happy sounds around the house. Though we are missing the two older boys, Jameson and Abraham, today, we are glad the Abbie and Eli are home from college and that Shoshanah and Josiah are still here as well. And . . . I am profoundly grateful also to celebrate with Mary our 32nd anniversary today. There is much for which to be thankful! From the sublime to the ridiculous — Noise! So this time last week Mary and I were basking in the quiet of a few days on the southern California coast. 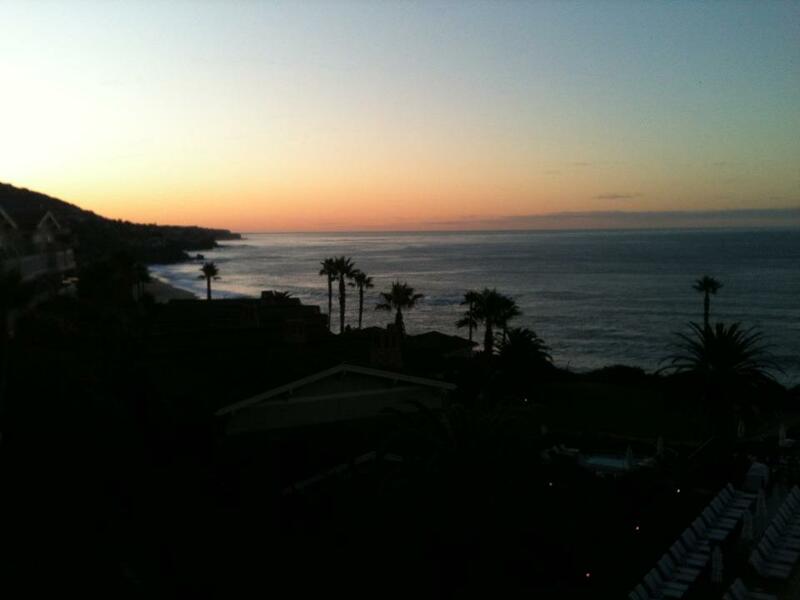 The vistas were accented by unfamiliar but beautiful flora and fauna and the only “noise” normally was that of the restless yet calming cadence of the surf just “over there.” Our last view was a sun rise over Laguna Beach as we left on Sunday morning. 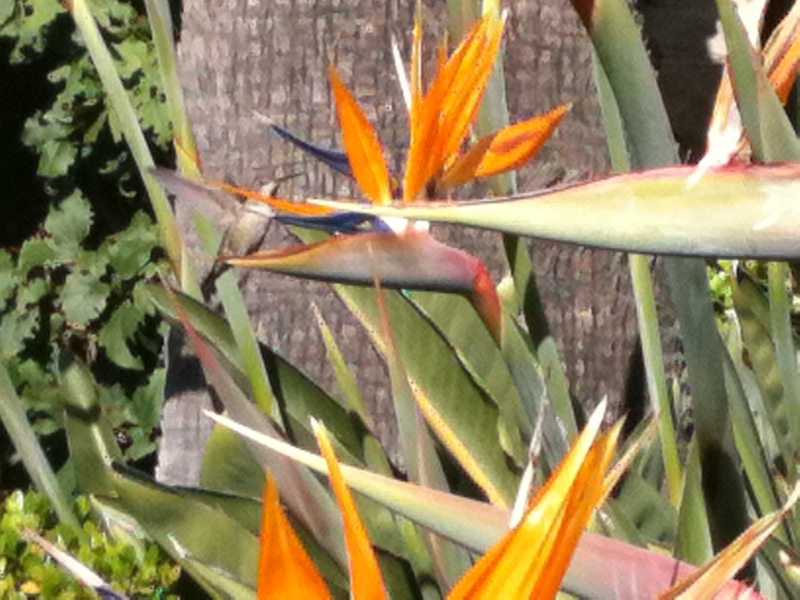 While there, among numerous memorable times, one sweet moment occurred as we walked by a bird of paradise planting and heard, then saw, a hummingbird. I for one did not know they sing as they fly and hoover. It was a great moment! This is not “noise” to sleep by! Fortunately, a few minutes later as the helicopter slowly moved away, the same voice said, “We apologize for any fear. Our suspect has been apprehended.” As reassuring as this pronouncement might have been, these sounds remind us that we who walk among noise live in a broken world that desperately needs the redemptive grace of our loving Savior. Come Lord Jesus, save us from such noise. So, our Board of Directors’ meeting is over and I have had a couple of hours to kill, no, . . . enjoy! by hanging out in the library at the Joni and Friends International Disability Center in Agoura Hills, Calif. Then in a bit I head south to Laguna Beach for a President’s Retreat with Joni and others. But while here at the IDC, I browsed through part of Joni’s art gallery and saw this painting below (with a detail). I want to go there! It is a multi-media piece: pen and ink, watercolor wash, pastels and colored pencils with splashes of oil. Called (surprise! ): “Light in the Forest.” Enjoy! As mentioned earlier on this blog, a couple of weeks ago, Ken Myers (Mars Hill Audio) visited with our school community for a few days. In his first session with our faculty (when he also introduced me to the poem sparking my title for this blog), he spoke about our need to recapture the art of “wondering,” and I think he was pointing at us as much as at our students. In a time of schedules, “do lists,” and back-to-back appointments followed by demands of family, home and it goes on and on . . . little time is left to wonder. Ken mentioned that we use the word pandemonium to speak of chaotic times, forgetting the root for the word means “all demons.” He reminded us as well that in one memorable letter from Screwtape to his apprentice Wormwood (letter #22 I think), the elder demon admonishes the younger never to allow his subject extended time for quiet and reflection. His made a strong point that “noise” always works in their favor and the 20th century seems to be solidly on their side in this regard. Ironically, I write this in an airplane 30,000 feet above the lands between Orlando and Los Angeles. There is so much noise it is actually almost quiet. So I can wonder about wondering. And I see several currents all coming together. Not only did Ken spark the thoughts, but on the heels of Ken’s remarks came the lecture from McCullough. One of his more memorable stories was of an exercise required by an unforgettable professor at Princeton. This man tasked his students with looking at a fish . . . for hours. And McCullough recounted that only after he thought he should bored to death did he begin to see more – symmetries, beauty, detail – that he had not seen before. Then he began to sketch and saw still more. He wondered at the fish. Some years later, he told us, his wife made him a small framed piece which hangs over his desk: “Look at your fish.” Further, he said that many people ask how he writes and researches, but nobody asks about how he thinks. Writers have to take time to think, he said. The best writers need to wonder. Aristotle says that all philosophy begins in wonder, . . . . It’s all the difference between beholding and analyzing, not that analyzing doesn’t have its uses, and not that it isn’t necessary, but it isn’t the first thing to do, nor is it, I think, the most significant thing to do. The word itself suggests why not: to analyze is to break into parts. But to behold is to look upon a thing in wonder as from a distance, and to appreciate it as a shining whole, and to seek to sense some small measure of the mystery of its being. I think wondering requires an orientation of the soul – away from the many to the few (and ultimately to the One), away from the busy to the still, away from the noise to the quiet. It is a terribly inefficient use of time wondering is, but I think it’s a crucial necessity of being human. When we wonder we are reminded that there is a God who creates – not only the things we wonder about, but our very capacity to wonder at His creation! When we wonder we become small again and that is not a bad thing. Too often people equate their busy-ness with some perverse and distorted sense of their indispensability. But it is good to be reminded that we are far less necessary to our world than we care to realize. This is why worship must bring us ultimately to a place of wonder – wondering at God’s bigness and significance and beauty, and admitting our smallness in it all. God our Father, after all, is the most wonderful Being and Idea in all the universe! I am not a morning person! One of my personal creeds is that a person should only experience the five o’clock hour once a day. But, ironically, on those rare occasions when I have risen early, I have found peace and quiet. One would think I would pursue such opportunities more. One recent early morning I was able to catch the view on this blog’s masthead. Admittedly, it was not that early. I was at a retreat center at Lake Yale in north central Florida with The Geneva School’s upper school retreat back in August. Coming out of my cabin a few minutes before 7 a.m. the sun was just rising over the mist laden lake. I walked over to the outdoor chapel area and snapped the picture with my iPhone. You see what I saw and it was breath taking. 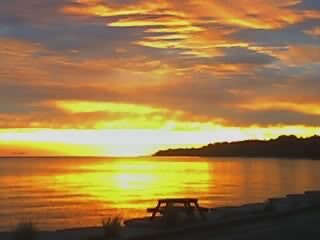 Below is another sunrise — from an early summer morning on Lake Erie (much earlier — about 5 a.m.). Being that far north, the sun rises quite a bit earlier. I was there visiting my mother for the last time before her death a few weeks later. One of the things that defines our humanity and sets us apart from the rest of creation as people made in God’s image is our tendency to see a setting like this and stop in wonder and awe. I tell people that though my border collie is smart, she never stops to consider the beauty of a sunrise or sunset. We are made to love beauty. It was a great evening and here’s a hint to all adult children of reading loving older adults: Christmas idea — McCullough’s new book: “The Greater Journey: Americans in Paris” (at an Amazon near you!). “For those who walk among noise” — Why call a blog this? That phrase in the last line caught my attention. We “walk among noise.” We live in a day with audible, visual, digital, technological, and informational noise on every side. And in this noise we too often lose the simple significance of carefully communicated words. We need quiet. We need times to sit with coffee at sunrise and be able to hear ourselves think. I’m enjoying one of those rare moments right now. Alone at home (that’s saying something! ), with Boo at my feet, all I hear is the grandfather clock’s reassuring cadence and the tapping of the keyboard.
. . . like the grandfather clock! This is a day to remember the Saints. When we think of this, we often think of those heroes in the faith who have come before us and more specifically, those who have died on account of their faith. We had an English lesson, so maybe some history will be helpful too – in the early 600s the Roman emperor gave a famous Roman building, The Pantheon, to the church. The Pope at the time removed the pagan statues of Jupiter and such and renamed the building as the “Church of All Saints.” Then the remains of many martyrs – people who had died under former Roman persecution – were moved to this building to honor their having died for their faith. These martyrs were rightly honored for their sacrifice of faith. Over the centuries many practices – some quite dignified and some quite strange – have come and gone with this celebration – but the most common practice has been to use the time to remember heroes of faith, people we look to for inspiration and example for our own lives. And this of course is not a bad thing. But by the 1500-1600s, most people began to think that the only way to be a real saint was to be a priest, a monk or a nun – serving God through “holy orders.” So I think it was no mistake, in fact it may have been God’s providential ordering of things, that in 1517 on “All Hallows Eve” the day before All Saints Day, Martin Luther is considered to have sparked the Reformation with some important ideas he wrote – we now call that document “The 95 Theses.” One result of his reforming ideas, one important result of the Reformation, was that all who follow Christ in faith are saints, not only those who serve at the front of the church. Luther said a person could be a butcher or a baker and serve God to His glory as much as could a priest or a martyr. So who are the “saints”? In Romans 1:1 Paul addresses his letter “To all those in Rome who are loved by God and called to be saints.” Here and almost 60 more times in the NT, the word saint is used to refer to those who are followers of Christ. Not just the accomplished, “holy” followers of Christ, but all who call on Christ as Savior. Even the most holy saint (and yes, that is a redundant repetition) is still one who, on his or her own, is a depraved sinner. Every saint was chosen by God unconditionally; that is, no saint was chosen by God based on what he or she has accomplished. Every saint was called by God’s irresistible grace, not be virtue of strong faith. And whether a saint died peacefully or died under severe duress of suffering and persecution, their faith was preserved by God, not be their own strength of body or soul. Whether you die for the faith or simply die in the faith, when you die trusting only in Christ, you die a saint. But of course, being a saint is not just about dying – it is about living. My young friends, we have to get this right! It is not as if we work real hard and make it to the major leagues of Christian faith by being good and doing good – no one can hit enough spiritual home runs to get into heaven. God never qualifies saints based on their goodness. He qualifies them – and us – based on His goodness for us. In fact, God says this clearly through the prophet Isaiah. Isaiah 30 surprises us – God says there “in repentance and rest is your salvation; in quietness and trust is your strength.” God hardly ever does things the way we expect. He uses unholy people to be His saints. Do you see where this is going? While we remember the saints on All Saints Day, Reformation Day helps us remember that there is only one true Hero of faith (Hero with a capital H). It is Jesus. He is our Hero. The book of Hebrews says we run a spiritual marathon of life, looking to Jesus as the Author and Finisher (the Hero) of our faith. Paul says “not many of you were wise or rich or good looking” . . . and none of us is righteous – holy – on our own. “He who knew no sin became sin for us that we might become the righteousness of God,” the saints of God. May God give us all the grace we need not only to understand, but to believe these things. Amen.